Hi folks, my name is Endy Edeson, the guy next door to you. Welcome to 2018. Happy new year. While we celebrate this day, it is pertinent for us to reflect on our lives and think of what the new year has in stock for us. My question for you today is: how determined are you in achieving your dreams and goals this year and every other year? Accomplishing goals is on almost everybody`s mind, but what makes the winners different from losers is Determination! Determination means refusing to give up when things get hard. Success is often hard-won, coming only after numerous failures and disappointments. Determination keeps one from giving up. If you want to achieve something, you'll have to leave your comfort zone which could be uninspiring environment or negative people. If you face failures in the beginning, don't let them discourage you. Try to try until you succeed. Manage your time efficiently. Remember, we only hope to reach at least 100 years old on earth, so each day of your life counts. You don't have to totally stop yourself from enjoying like hanging out with friends, going to party…. Be your normal self, do things that you did previously but reduce the time limit of your enjoyment. Make your dreams your uttermost priority. Never Doubt Yourself. Believe in your Abilities: Tell yourself, "If I try, then I will succeed." Enter every activity without giving any mental recognition to the possibility of defeat or failure. Concentrate on your strengths and improve your weaknesses. Make a to-do-list of the things you want to achieve this year and start working on it. Don’t be discourage if you did not achieve everything on the list. If you are able to achieve at least 6 out of 10 things on your to-do-list, you have to be grateful and thankful. Don’t ever think of having everything you desire. The beauty of life is the appreciation of the ‘’LITTLE’’ things we have accomplished in life. I want to let you know that it’s never too late to achieve that goal. Age is no barrier to starting and fulfilling your dreams. 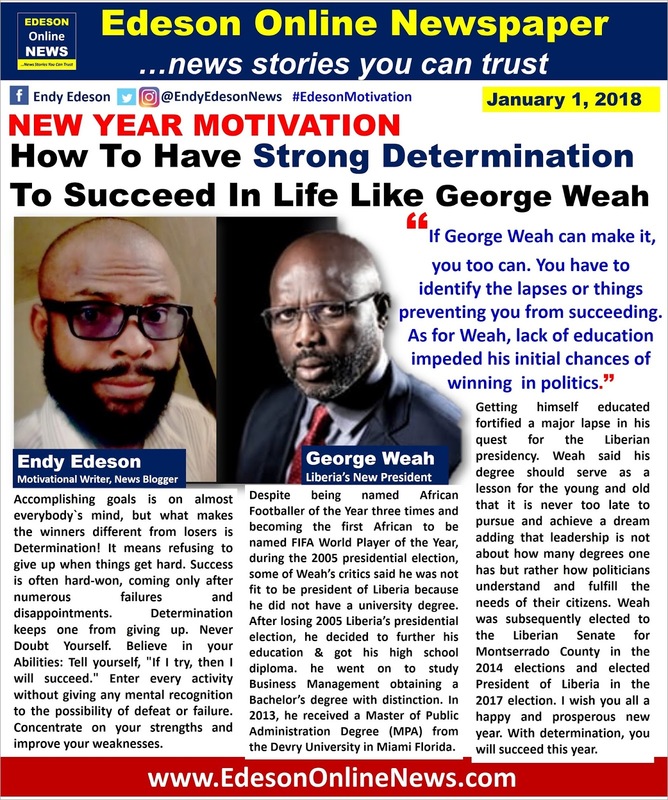 Liberia’s new president, George Weah is a young man who despite his humble beginning rose to become a world icon. Weah became involved in politics in Liberia following his retirement from football. Despite being named African Footballer of the Year three times and becoming the first African to be named FIFA World Player of the Year, during the 2005 presidential election, some of Weah’s critics said he was not fit to be president of Liberia because he did not have a university degree. He actually dropped out of Secondary school in his teenage years. His then opponent Ellen Johnson Sirleaf is a Harvard graduate. After losing 2005 election, he enrolled for SSCE in 2006 and got his certificate in 2007 at the age of 40. In 2011, he went on to study Business Management obtaining a Bachelor’s degree with distinction. In 2013, he received a Master of Public Administration Degree (MPA) from the Devry University in Miami, Florida the USA, fortifying a major lapse in his quest for the Liberian presidency. Weah said his degree should serve as a lesson for the young and old that it is never too late to pursue and achieve a dream adding that leadership is not about how many degrees one has but rather how politicians understand and fulfill the needs of their citizens. 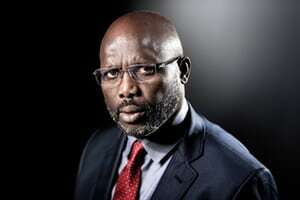 Weah was subsequently elected to the Liberian Senate for Montserrado County in the 2014 elections and elected President of Liberia in the 2017 election, defeating the incumbent Vice President Joseph Boakai. Guys, if George Weah can make it, you too can. You have to identify the lapses or things preventing you from succeeding. As for Weah, lack of education impeded his initial chances of winning in politics.